I ran into some disturbing news recently. News that makes me both angry and quite perplexed. It has to do with your pension (if you’re “lucky” enough to have one). Even if you don’t have a pension, this disturbing news could wreck your retirement plans. All because some bozos on Wall Street are completely inept at investment management. I’m not sure whether it’s a matter of incompetency or laziness. But frankly, it really doesn’t matter. What matters is that millions of retirees are going to wake up one day and realize that their pension fund payments stopped coming. At the same time, tens of millions of retirees are going to wake up to see a market calamity. As you know, we’re currently in the middle of a long-term bull market. Ever since the market bottomed following the financial crisis, stocks have been moving steadily higher. The current bull market is one of the longest-standing bull markets in history, now approaching eight straight years of advances. I read a statistic that said this is currently the third-longest bull market in modern history. You would think that pension funds would be benefiting from this extreme bull market, right? After all, we know that there is a pension crisis in the U.S., with an estimated $414 billion shortfall in what corporations need to be able to pay retirees. But instead of investing in the long-term bull market, allowing strong returns to make up pension shortfalls, pension fund managers have been underweighting U.S. stocks. 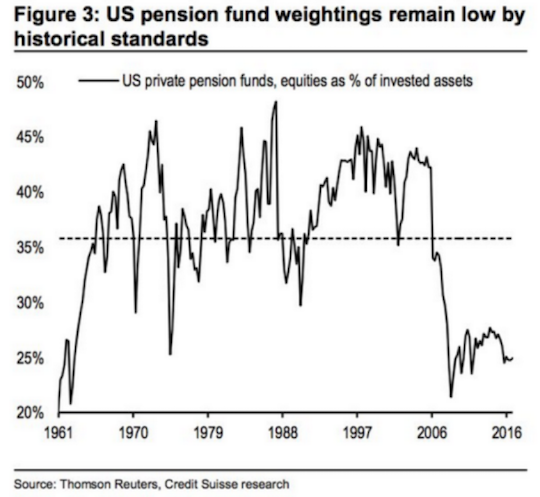 As you can see, when the financial crisis hit, pension funds reduced their exposure to stocks to the lowest level since the 1960s. Ironically, this is the exact time that pension funds should have been increasing their exposure to stocks! Over the next eight years, not much changed. As the market plowed steadily higher, pension fund managers kept their portfolios conservative — allocating capital to things like Treasury bonds and “investment-grade” corporate bonds that paid next to nothing. Remember, this is an eight-year period with interest rates at or near zero percent! What a horrible time to be invested in bonds! So during one of the greatest bull markets in history, pension fund managers have put your capital on the sidelines, missing out on huge potential gains and investing in bonds that pay next to nothing in interest. Can you see why I’m so angry? If you think your Social Security retirement package is any better, think again. The Social Security trust fund has zero exposure to the current bull market. Instead, the fund invests in U.S. Treasury bonds. The very same bonds that are paying next to nothing in interest. According to research firm Nolo, the Social Security trust fund will run out of money in 2035. That’s less than 20 years from today. It’s unclear what will happen to Social Security payments at this point, but there’s a good chance that your benefit checks will be much lower than what you’ve been promised. So relying on Social Security payments to fund your retirement is simply wishful thinking. It’s irresponsible for you to make financial plans expecting your benefit checks to come in like clockwork. You already know this. I’m just reiterating how important it is to have a backup plan. It’s clear that you can’t count on corporate pensions or Social Security payments to fund your retirement. Those systems are broken and will not likely be fixed without severe pain to the markets and to taxpayers. So what can you do to protect your standard of living during retirement? I believe the best way to protect and grow your retirement wealth is to invest in a handful of alternative opportunities. An alternative to corporate pension plans and Social Security benefits is to piggyback the Canada Pension Plan (CPP). I started following the Canada Pension Plan a couple of years ago because I was so impressed with the way this government program was run. Instead of investing retirees’ capital in low-yielding government bonds, the CPP invests in free-market companies that are generating reliable profits (and paying out reliable dividends). In other words, the CPP has been exposed to the long-term bull market of the last eight years. And Canadian citizens have the safety and security of knowing that their pension plan is actually growing ahead of schedule, with a surplus of assets available to pay retirees. That’s a much better way to invest, don’t you think? In today’s market environment, you can’t rely on the traditional retirement income sources. Pension funds are making horrible decisions with your capital. And the Social Security trust fund is running out of money. 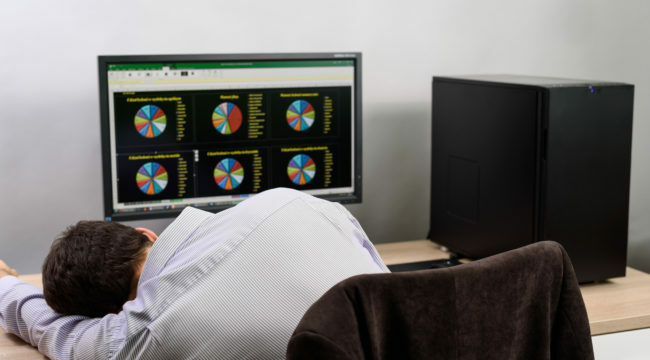 But by taking responsibility for your own retirement and taking advantage of some nontraditional investment opportunities, you can secure a reliable and fulfilling retirement.